The Jewish holiday Tisha B’Av starts tonight. It gives one license to be sad over the state of the environment. We know that it’s not productive to dwell on environmental doom and gloom. Green Prophet readers are modern and hip people; we are environmentally responsible, but hey, not totally perfect. Every so often, we just need to cry. We can put on a Tori Amos album, curl up in a ball in our beds and weep like there is no tomorrow. And it can feel good, because sometimes the world and what humans do to it is just plain sad. Take today for example. Starting nightfall, starts Tisha B’Av or the Ninth of Av, the saddest day of the Jewish calendar. Major calamities happened on this day in Jewish history – such as the destruction of the Temples in Jerusalem, and the expulsion of the Jews from Spain. To mark this day of tragedy, observant Jews fast starting nightfall today. They don’t wear leather, they don’t wash their bodies, they don’t use oil products and refrain from marital relations. Among the list of customs, one of the most pronounced is that Jews should be sad. Very sad. Playing music or participating in activities that bring joy are discouraged. Some people go to great lengths to be unhappy by reading unpleasant passages such as “Lamentations” in the Bible and by sitting on uncomfortable chairs. To get our Jewish readers in the right Tisha B’Av spirit, we have collected a list of the 5 saddest environment stories from the last year. Get your tissues out and let the tears pour. …None of us were prepared for what we would see next, when the bus reached a spot where an earthenware dam ended the river’s natural flow. Called the Alumot Dam, water is then removed from the river in large green colored pipes to be used for agriculture and other uses. The intent of removing these moments of joy is to startle us out of our complacence. Things are not all right. What must we do to change our ways? How can we improve ourselves and in so doing, bring about a better world? In the face of overwhelming destruction, it is a natural human instinct to pray. Jewish prayer is intended to both reach our Creator and transform ourselves. So, if the oil spill is worrying you, pray about it. Pray that the leak is fixed, that the waters are healed, that the children get to go back to the ocean. Pray with all your heart, and take actions that will transform you. And may our prayers and actions during this time lead to the redemption of our world. 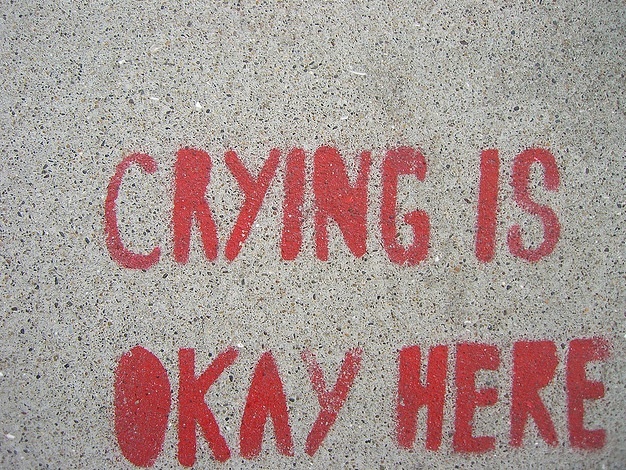 Though I don’t love the stories behind the sadness, I do love the idea that it’s okay to cry about them. Thanks for this, and have a – sad – day?